It had been almost three years since my academic semester in Kathmandu, and I was coming back. I was really coming back. Would the city look the same? Would I remember my homestay neighborhood? How would the family dog, Jenny, greet me? Probably with a growl. Definitely with a growl. For whatever reason, Jenny and I were never on the best of terms. From Tribhuvan International Airport, my colleague and I arranged a local taxi and flitted through Kathmandu’s streets with chaotic gusto. Well, until we hit traffic. Two and three and four-wheeled vehicles contending for space with people and pushcarts, stray dogs and large, lethargic cows. Kathmandu’s congestion pockets were hustling and bustling away. It smelled the same—like diesel, mostly. I rolled down the window. That particular afternoon, the air was just crisp enough to flaunt the distant Himalaya. It all felt so natural. The ethos of Kathmandu was within my grasp once again, and the feeling of dislocation that I often experience when hopping from city to city was gone. I was finally returning to a place I called home for nearly four months. A place where I discovered a passion for travel, a love of culture and a newfound understanding of world citizenship. A lot had changed in the past three years. Nepal had abolished its monarchy. 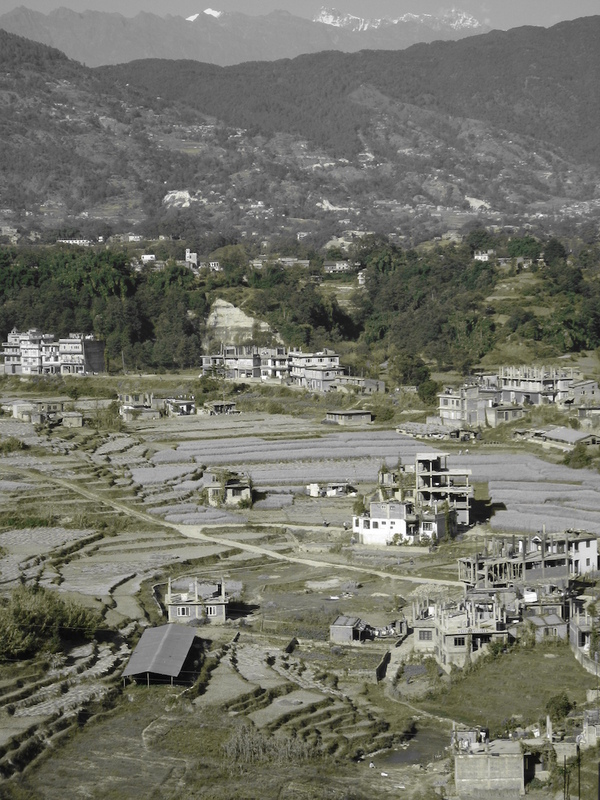 A ten-year Maoist insurgency—scattered with four cease-fires—had finally seen its end. King Gyanendra, before leaving the palace and retreating to the outskirts of Kathmandu, handed in his scepter, peacock-feathered crown and royal yak hair. Buildings rose and restaurants opened. Dense became denser, and urban survival masks became the new fashionable accessory for the pollution-conscious populace. Of course, much stayed the same. Thamel, a bubble of tourism, was still Thamel. Lonely Planet trekkers, Europeans and Israelis and Australians, buying tiger balm, knock-off (and sometimes kitschy) media, clothing and outdoor gear. Banks, image developing centers, countless tourist agencies – it’s all here. You can book flights to Lukla, the launch point for all Everest-bound trekkers, or buy bus tickets to Pokhara (flying is safer! 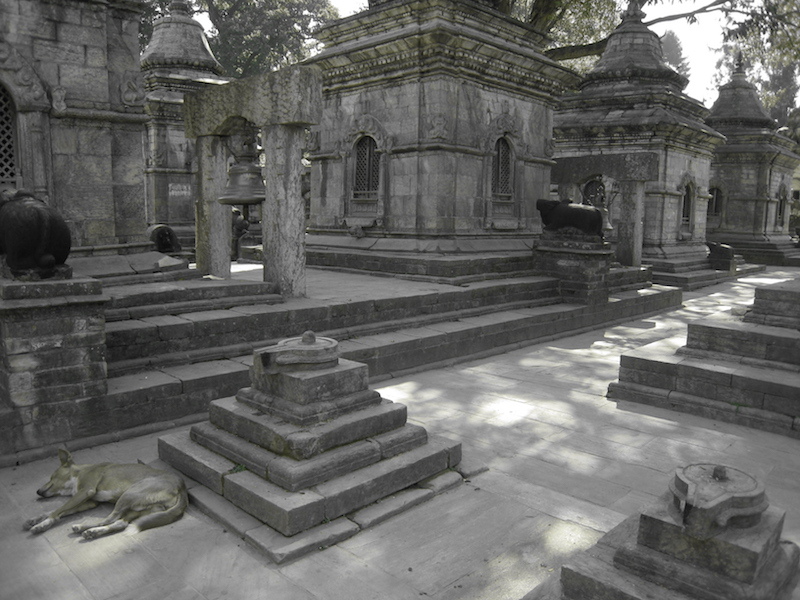 ), a popular destination just west of Kathmandu. You could be an ice axe wielding mountaineer, neophyte Buddhist or substance seeking nomad and find a way to blend in. Thamel’s cramped streets will satisfy your every tourist need. My colleague and I powered through work and spent the latter half of our week living Kathmandu to its fullest. We sipped hot ginger coke and raksi, a traditional millet (or kodo or rice)-distilled alcohol, typically brewed at home. We stuffed ourselves with samosas, lentils, and buffalo momos, Tibetan dumplings that cost about a dime each. At the Everest Steak House, a Thamel restaurant that offers 33 different styles of steak, we drank Gorkha beer and cheap apple brandy. We listened to music at Jazz Upstairs, met a professional photographer and made friends with a British girl working for Save The Children. We traveled to the Pashupatinath temple complex, to Boudhanath stupa and to Swayambunath, the temple where wild monkeys run amok. It was a memorable week. The last morning, we rented mountain bikes and joined a group of eleven foreigners and locals, many of them working for the World Food Program. 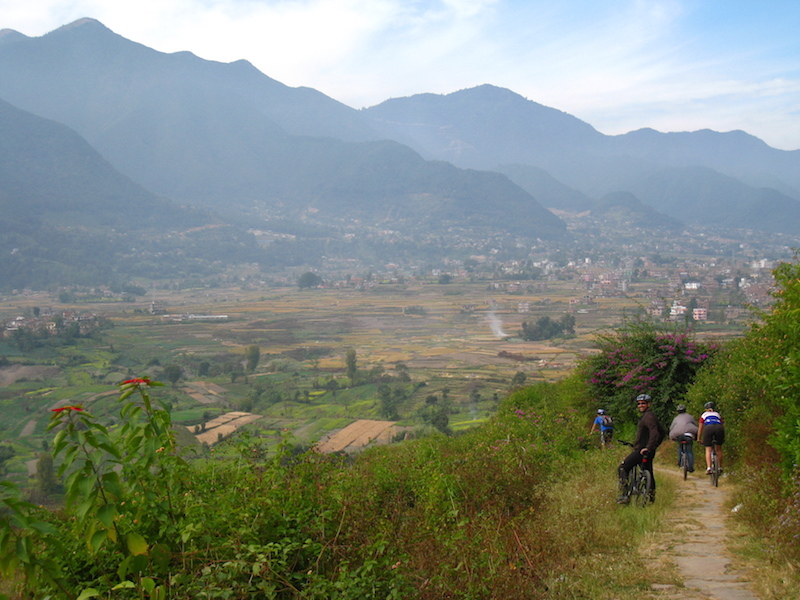 We biked to the edge of the Kathmandu Valley, past goats, chickens, dogs and cows, some tethered, most wild. Past burning piles of trash, steel welders and motorcycle mechanics, brick layers and momo-filled pressure cookers. It was so nice, after nearly a month of city-based work to travel outside of Kathmandu. To smell clean air and see rice paddies. To stretch my legs and cycle away. The ride was tough—my homestay brother watched me tumble off a one-lane track—but well worth the experience. Returning to Thamel that afternoon, I felt spiritually renewed. The nostalgia and comfort of Kathmandu had officially set in, and I knew, I just knew, that I would be back again. Nepal looks awesome. I am traveling India fairly shortly and plan to jump the border and spend sometime in the mountains. Thanks for the inspiration. .-= Jonny | thelifething.com´s last blog ..Your Chance To Read Possible The Worlds Longest Blog =-. Man, I love the photos. You take great pictures. I bet that mountain bike trip was really cool, seems like it would be a great way to take in the countryside. .-= Nate´s last blog ..travel goals and Frequent Flyer Master review =-. NOSTALGIA! I was there last May for a month and I LOVED it. I can’t wait to go back. Great article and pics! Thanks for making me yearn again for Nepal, haha. .-= Casey´s last blog ..Photo of the Week: Into the Blue =-. 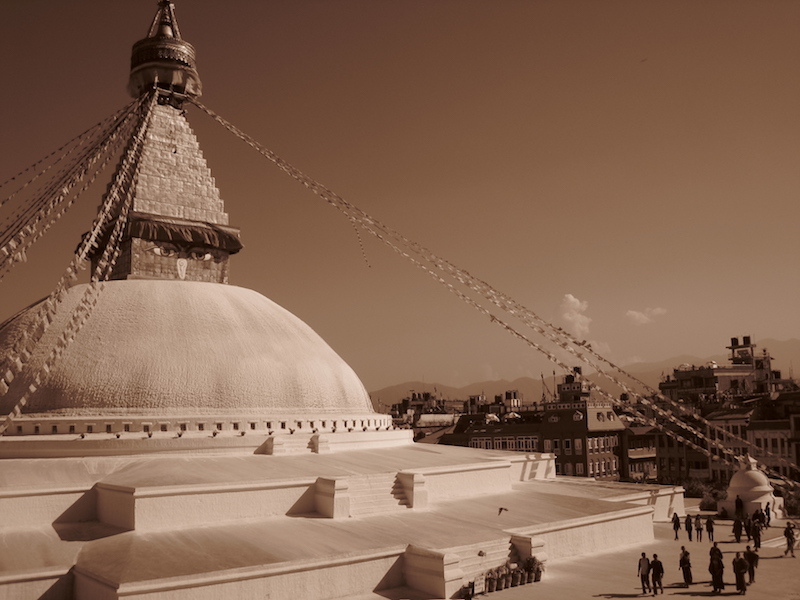 I always enjoy a great post about Nepal. Such a wonderful country, I was happy to spend 6 weeks there in 2008, and look forward to my eventual return as well. .-= Dave´s last blog ..Faces From Around the World: England =-. Beautiful photos Alan, as usual! I’ve long wanted to visit Nepal as well—had an old girlfriend/still good friend who did a lot of aid work over there and made a lot of friends. .-= Cody McKibben´s last blog ..Social Media Marketing Education for Small Business Entrepreneurs =-. Stellar! Thanks for painting this picture of your travels…it only inspires make my travel plans in 2010 that much bolder. .-= Robert´s last blog ..Creating Income | Busting Barriers & Mock Testing =-. @all: Thanks for all the positive comments everyone! If there’s one place in the world I love to share, it’s Nepal. Feel free to get in touch if you’re planning a trip there or just want to chat more. .-= flip´s last blog ..30 Things to do before I turn 30 =-. Hi this is a great Article .. This is a socila networking web site for the gorkhas round the globe. Stunning photographs. I am an amateur photographer, how do you set your camera and what settings do you use? I also want to travel around the world and take photographs everywhere for documentation. I must say that Nepal is one of the beautiful places in the world. And just like you, I said to myself that I am coming to back to this place. Fortunately, my parents are celebrating their 50th anniversary and they want to celebrate it in Nepal. After I learned about it, I really got excited.